Hello readers. I hope this finds you well. In this post I'll be reviewing the new Plantronics Blackwire C725-M Active Noise Cancelling USB Headset. First, I'll say that I've been using headsets for telephony since 2000. I've used all sorts in my time. Starting with a GN Netcom, whose model escapes me, plugged into the dedicated headset port of my old Interquartz Enterprise Discovery handset. Wow, that takes be back! Fast forward a few years and on to the next job and I was using a Plantronics Mirage with another Interquartz handset. Then on to the Plantronics CS50 with handset lifter, this time on a Cisco handset. When the battery for the CS50 was on its last legs after 6 or 7 years of use I got the Plantronics Voyager Legend CS, still on the Cisco phone. I also had a Voyager Legend UC which I was using for Lync and mobile. The common thread among all of these headsets is that they were always monaural (one ear) and they were all over the ear, either as standard (Mirage) or using the enclosed conversion kit. I moved to a new company and I still have my Voyager Legend UC. I used that as my daily driver for over a year. I used it in an office setting for a few months before I started working from home where I continued to use it. I used it in the home office and when on the road. 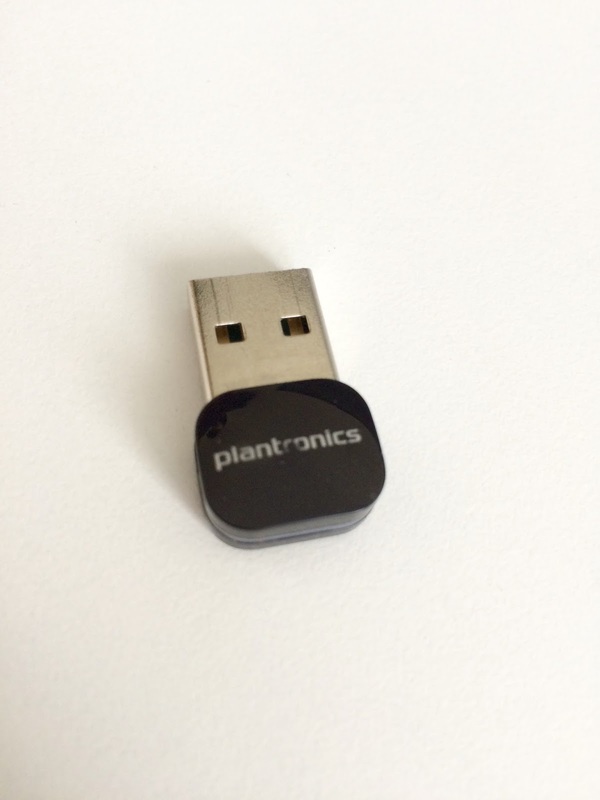 Paired with the familiar Plantronics USB Bluetooth Dongle (I now have several!). A couple of months ago I received some new headsets to try out. What happened next surprised me. I not only replaced my Voyager Legend UC as my daily driver, but went from over the ear monaural and wireless to a corded, over the head, binaural in one easy step. The Plantronics Blackwire C725-M is a USB Headset with Active Noise Cancelling and hi-fi stereo sound which is qualified for Lync and Skype for Business. If you use Lync or Skype for Business you need a headset. I know some of you think you'll never be able to let go of a handset, but trust me, you will. All you need is the right headset. Plantronics say that you should choose this headset if you work in a noisy environment. I say they are right, but is more than that. This headset offers a truly immersive experience to your voice calls. I know that sounds cheesy, but when I use this for a call I really feel like I'm having a personal conversation. The audio is rich and warm. The binaural speakers and active noise cancelling make the conversation private. Just for you and those that you are speaking to. It's like you are in a sound booth recording a show. I work from home in a small room at the front of my house. About 30 or 40 feet from my window is a very busy road. I also get a lot of afternoon sun so often have the window open. Outside my office door I can hear my wife and toddler moving about the house throughout the day. So it can be a pretty noisy environment. I have several one to one and conference calls every day. I've asked several people how I sound using these and I've had nothing but positive feedback. Not only can I hear the people on the call very clearly. The active noise cancelling dulls the background noise for me and the clever design blocks out all but my voice to those on the other end of the call. Whats more is that they are surprisingly light and comfortable on the head even though they look heavy. The Smart Sensor technology means that they automatically answer a call when you place them on your head. Well... its a headset after all. It claims hi-fi stereo sound. And I can confirm it really delivers. The first day I got these I adjusted the sound settings on my laptop so I could use these for Lync calls AND for music playback. I plugged in my iPhone which has my music collection and fired up iTunes. The sound is so good I didn't take them off all day. And apart from slightly sweaty ears they were very comfortable to wear all day. The music was very rich and, like the spoken word of calls, warm. They made good music sound great. I found myself going through my music for a few songs to find the next great track before setting with random for the rest of the day. I already had the accompanying Plantronics Hub software installed so I had the software set to pause and resume music in Windows Media Player and iTunes when I received incoming calls. If you haven't figure it out by now, the answer is a resounding yes. I'm not going to tell you that they will replace your dedicated music headphones you paid all that money for. The hi-fi stereo sound is great for audio calls, but equally great for Webinars and for music/multimedia playback. The fact that you get audio this good in a device you will use for telephony means that you can use them for everything while working. Perhaps a noisy road on my own in a home office isn't a fair test. But I would definitely say that these would suite anyone in a noisy office, a call center or sales floor perhaps. I also think anyone that needs some isolation to concentrate on a specific task. The active noise cancelling and on-ear binaural design truly take you away from the hustle and bustle of the office and transport you to that private space where you are most productive. Phone calls become more private and natural. And because you're wearing a headset both hands are free to take notes or continue to work. The Active Noise Cancelling is good but I've experienced better. Always in expensive dedicated music headphones, but better nonetheless. I think it is more because they are on the ear rather than over the ear that I can still hear specific noises like myself typing or fingers snapping. There is a difference between having it turned on off so I know it is doing what it is supposed to. They dull the ambient noise but don't completely block it. It's also fair to say that these are better at noise cancelling than some premium music headphones. The only thing I would change is that there is no Bluetooth support. These are clearly a successor to the similar Blackwire C720. The C720 were very similar but lacked noise cancelling and had Bluetooth Support. So you could pair them with your mobile while using them for your PC audio. I can see why they didn't add it as having both Bluetooth and Active Noise Cancelling would add complexity, weight and probably cost. For me, it means I need to use one headset for mobile calls (or just pick up the phone) and another for Lync calls. It would be nice if they found a way to have both in a future version without compromising something. All in all a great pair of UC headphones. I don't often use these for music playback anymore, but I still use these as my primary headphones for Lync while I'm in my home office. I don't take them with me on the road because I have other choices. You'll read about that in the next issue. As you can see I am still a dedicated headset user. I don't have a phone on my desk and probably never will except for testing or provisioning. I don't need one because I use Lync, but also because I have a great headset. For more information about their extensive range of headsets for Lync and other products visit http://www.plantronics.com. Always choose qualified devices for Lync and Skype for Business. For more information about qualified headsets visit the Solutions Catalog at http://partnersolutions.skypeforbusiness.com/solutionscatalog/personal-peripherals-pcs.